Now that we’re in the new year, we all have a bunch of resolutions that we want to stick to. For me, I’ve been working way too hard 5 Signs That You're Working Too Hard (And How to Fix Them) 5 Signs That You're Working Too Hard (And How to Fix Them) Do you suffer from an insatiable desire to work? Here are some of the signs to recognize this ailment and how you can overcome it. Read More , so one of my resolutions is to work less and stress less. But as you likely know, that’s easier said than done. There are many ways to beat stress, such as practicing yoga 5 Top Yoga Channels On YouTube That Help You Beat Stress 5 Top Yoga Channels On YouTube That Help You Beat Stress After a stressful day, a few minutes of yoga can mean the difference between anxiety and rest. Load up these YouTube channels and don't be surprised when your stress melts away. Read More , meditating mindfully The 10 Best Calming Apps to Relax, Destress, and Clear Your Mind The 10 Best Calming Apps to Relax, Destress, and Clear Your Mind Life can sometimes overwhelm you with stress and anxiety. That's when these calming apps can help you destress and clear your mind. Read More , playing video games Science Proves that Playing Video Games Reduces Your Stress Science Proves that Playing Video Games Reduces Your Stress Playing video games can relieve your stress, reduce your depression, and make you feel better. Read More , and improving your work environment Stressed At Work? How To Relax & Focus In An Open Office Stressed At Work? How To Relax & Focus In An Open Office Does working in an open plan office kill your productivity? You can probably blame the Germans for its wide adoption. But let's reconcile after you tried these tips. Read More . If it’s really bad, you may even want to switch to a not-as-stressful job Is Your Job Too Stressful? Here's Your Way Out Is Your Job Too Stressful? Here's Your Way Out It's never too early to move on from a stressful job. Becoming a freelancer can increase your satisfaction, creative freedom, and productivity. And it can be safer to be an independent contractor. Read More . Seriously, give it a listen and come back to this post when you’re done. It’ll only take eight minutes, plus we aren’t going anywhere. So, how was it? Do you feel more relaxed now? Perhaps you even feel drowsy and on the edge of sleep. If so, you wouldn’t be the first. As it turns out, Weightless has been scientifically proven (by researchers at Mindlab International) to reduce anxiety in listeners by up to 65 percent. In fact, Weightless is more relaxing than any other song that’s been tested so far. But perhaps the most interesting bit is that this song by Marconi Union was intentionally designed for purposes of stress reduction with help from sound therapists. Interested in more of these songs that are proven by science to be stress reducers? 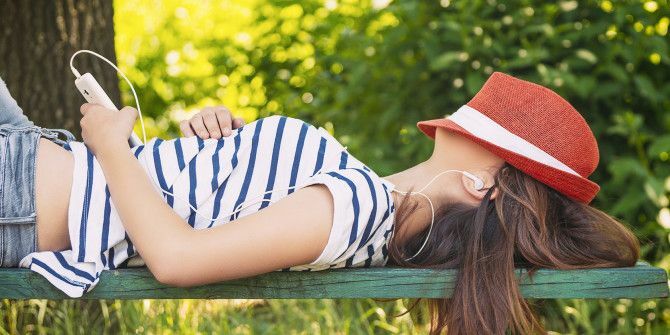 Check out our overview of the most relaxing songs according to science The Most Relaxing Songs of All Time, According to Science The Most Relaxing Songs of All Time, According to Science "The Most Relaxing Tune Ever" is actually a thing, and scientists have determined a Top 10 list of relaxing songs. It's about time we revisited some of those more tranquilizing numbers. Read More . How stressed are you? Are you taking any steps to rectify that? Do you have any tips or tricks for reducing stress? Share with us in the comments below! Explore more about: Geeky Science, Relaxation, Stress Management. Stressed me out. I kept wanting it to develop a melody, have some pattern I could follow. It felt really random and kept preventing me from settling into a groove and chilling. I started skipping forward, looking for some point at which it would develop some coherency. Didn't find it. This did the exact opposite of what it was supposed to do. I'm even more stressed after listening to this song, the first minute went well then my boss came into my office to ask me why I was listening to music instead of working.